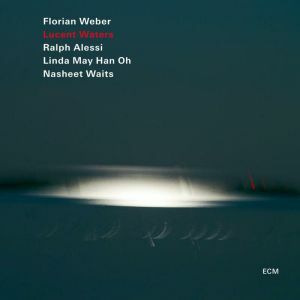 Ralph Alessi: trumpet; Florian Weber: piano; Linda May Han Oh: double bass; Nasheet Waits: drums. Lucent Waters the new ECM release from pianist Florian Weber, with the phenomenal cast of trumpeter Ralph Alessi, the phenomenal bassist Linda May Han Oh, and Nasheet Waits on drums appears to carry a nautical theme with some of the music, but it is clear that it’s a carefully conceived exercise in drama through it’s various tone poems and the sound scapes created. When a listener thinks of a nautical thematic thread for jazz, probably Herbie Hancock’s title track to Maiden Voyage (Blue Note, 1965) comes to mind with it’s timeless melody and vibe redolent of a slow moving sea vessel, but Weber’s present recording at hand concretely in part, through sound brings to mind various states of water and expertly crafted moods. The four distinct personalities of the players form an appealing band dynamic as well. Weber likes to make room for lots of freedom in his music. With the musical personalities mentioned above through their differing means of expression a harmonious whole is achieved. The pianist is generally thoughtful, while Waits’ forward momentum generally pushes things along with a marked intensity, May Han Oh’s bass brings a distinct clarity grounding everything. As she has done on her own as a leader, with pianist Fabian Almazan, and most recently with Pat Metheny in his quartet, much like Wilbur Ware, Ron Carter and Paul Chambers before her, her rich tone and perfect note choice guides things along. When she steps to the spotlight on the tumultuous “The Melody Of A Water Fall” amidst her flurry of notes, there is something to hold onto as the turbulent sea of Waits’ drums freely erupts behind her. The drummer is superb on the track emulating Japanese koto drums to a degree, as the track is informed by the sound of Japanese drums. Ralph Alessi appears for the first time on “From Costeau’s Point Of View” which is intriguing due to the use of simultaneous meters in 3 and 7, though with the delicateness of Waits’ cymbals the listener is generally directed to it’s easy going floating feeling. The pianist’s solo explores the crevices between the drums where the light cerulean shade of underwater contrasts with brightly colored coral reefs. “Butterfly Effect” demonstrates how good the quartet is at listening as they navigate the labyrinth canvases they are given to improvise. The melody, led by Alessi’s brightly brassy sound, moves with the grace of some of the great Wayne Shorter pieces on Miles Davis’ classic Sorcerer (Columbia, 1967) and in a sense captures some of the same spirit the Second Quintet had at interacting in lightning fashion. For example, Weber piggybacks off of Alessi’s last phrase as a motif to jump off of, and from there he naturally brings the piece to conclusion. The pianist is an expert of various moods, as the opening meditation of “Brilliant Waters” finds him strumming piano strings softly, inadvertently creating a wonderful way for “The Melody Of A Waterfall” to start. The closing “Schimmelreiter” buoyed by May Han Oh’s pedal point and the pianist’s subtle melody line suggests surreal portrait of a horse galloping in super slow motion. Lucent Waters makes so much out of contrasting styles utilizing a common ground to create music with wonderful imagery. As Weber, May Han Oh and Alessi have all played often in seperate contexts, there is a familiarity with each other that allows things to naturally happen with the quite open nature of the compositions. Hopefully the group collaborates more in the future as the album is a superb late year treat.